Phoenix Comicon 2016 was the busiest one to date, with record-breaking attendee numbers as well as record high temperatures. Even being blasted with a heat wave that cranked the temperatures up to 115° didn’t stop the masses from converging on Phoenix Convention Center for the largest Phoenix Comicon ever. Attendance was estimated a to be nearly 100,000 – a dramatic leap from the 75,000 that attended the convention last year. Fortunately, although the crowds were visibly larger, they remained orderly and the volunteers did a wonderful job at keeping everything organized. Comicon 2016 registration was moved into the North Ballroom and was a well organized affair. There was a minor hiccup with one of the day’s lines winding up outside in the heat, but con organizers quickly realized their mistake and made the necessary adjustments to make sure the rest of the days lines were kept indoors. Thursday Preview Day was the busiest to date. In fact, it was almost as busy as Saturday was last year! Comicon gave away numerous free passes for Thursday and Friday which ramped up the attendance and the money many con-goers saved was spent on the vendors in the Exhibitor Hall. Many vendors, especially local artists, said Phoenix Comicon 2016 was their best one to date. Phoenix Comicon 2016 hosted a wide variety of panels although I only attended a few and participated on two panels. Everyone generally seemed to be in good spirits and enjoying themselves at every panel I went to. Thursday night I attended “Out of the Vault: The Science of Fallout” in which scientists, including a couple of biologists, talked about nuclear radiation and how it would realistically affect humans, plants, and animals in a nuclear wasteland. After that I went to “My Favorite Panel on the Citadel: The Science of Mass Effect” in which scientists (including one of the biologists who was on the Fallout panel) discussed the really of FTL (Faster-Than-Light) space travel, the “mass effect”, the Genophage, and how all of these things could actually function in reality. Friday morning I participated in the “Cosplay Like a Pro: Advance Sewing Techniques” panel. 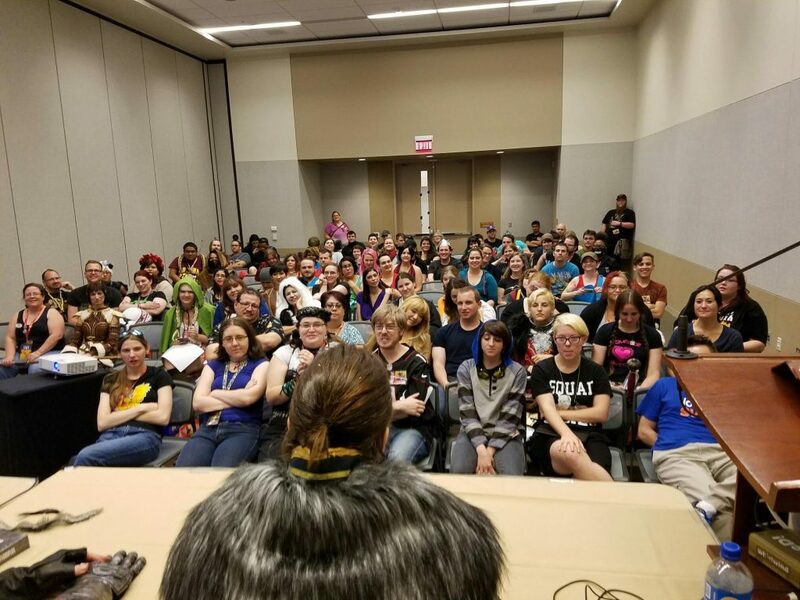 We had a great turn out for an early panel and discussed working with flat patterns, draping, and sewing with specialty fabrics like stretch vinyl and knits. Many of the audience members said they found the panel very informative. Saturday I participated in the “Riding the Iron Bull: Romance in the World of Dragon Age” panel. 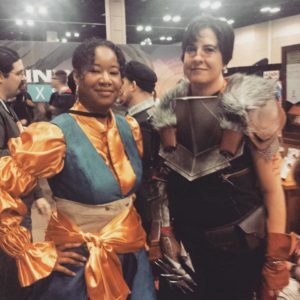 We had a full house and it was loads of fun geeking out with other Dragon Age fans. Sunday, the last panel of the convention I attended was the “Voice Actor Round-up” which brought together all the wonderfully talented voice actor guests including Maurice LaMarche, Jess Harnell, and Nolan North. They answered various audience questions and told hilarious stories (apparently William Shatner thinks Jess Harnell is Gene Simmons). Outside of the panels, the Exhibitor Hall was the main draw with plenty of variety in geeky merchandise. 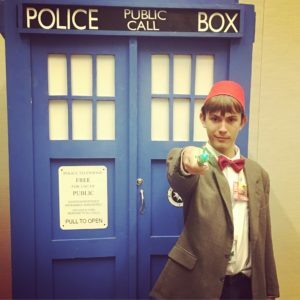 The Mystery Boxes – big cardboard boxes shaped like Mario “?” bricks and Portal Companion Cubes filled with $30 worth of random swag – were huge this year and I saw many con-gers lugging them around. My personal favorite convention purchase was the Smarter Garter, a purse attached to an adjustable garter that can be worn around the thigh, boot, as a belt pouch or a wristlet. For $45 it was the most useful con purchase I’ve ever made. I wore it as an accessory for one of my costumes and used it as my purse for the entire weekend. As far as cosplay goes, Deadpool was huge this year with dozens of them running around, as well as a couple Negasonic Teenage Warheads. There were several RWBY anime cosplays and a few Nathan Drake’s from the Uncharted video game series (guest Nolan North voiced the character). Some of the most unique cosplays I saw were Lock, Stock and Barrel from The Nightmare Before Christmas, Bill Cypher from Gravity Falls, and the Songbird from Bioshock Infinite. All in all, Phoenix Comicon 2016 was a success! My only criticism is that I wish it weren’t during summer because this year’s heat wave almost killed me in my cosplay. To those cosplayers and outdoor performers who stuck it out, you guys are champs! Phoenix Comicon is well on its way to becoming one of the best conventions of the west coast.